Kuehne + Nagel now offers less-than-container load rail shipments between China and Europe. KN Eurasia Express connects China, Russia and Europe. Kuehne + Nagel now provides LCL services from Wuhan, China to Hamburg and Poland. With the launch of KN Eurasia Express, Kuehne + Nagel offers less than container load (LCL) shipments between China and Europe. The new service complements the company’s existing full container load (FCL) rail offering for import and export shipments. KN Eurasia Express connects China, Russia and Europe. In addition to its established FCL service with Duisburg as the main European handling hub, Kuehne + Nagel now provides its own LCL services from the hub terminal Wuhan in China to Hamburg and Malaszewicze/Poznan, Poland. In total, Kuehne + Nagel serves more than 50 collection points in the People’s Republic of China, including key locations such as Shengyang, Chongqing, Chengdu and Zhengzhou. Besides import, the offering also includes FCL and LCL export shipments from Europe to Asia. KN Eurasia Express is targeted in particular at customers from the automotive, high-tech, and fashion industries. Cargo security is a main issue; Kuehne + Nagel ensures the highest security standards at terminals and, in particular, enhanced container seals for its KN Eurasia Express shipments. GPS-based data monitoring delivers real-time data on temperature, humidity, pressure, light exposure and position of the containers. 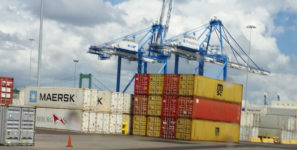 Temperature-sensitive goods can be shipped in 45-foot long reefer containers. The KN Eurasia Express product also covers countries in the European periphery. The first block trains have already been successfully dispatched to Turkey. LCL services between China and Russia are also being planned.